We're in Dubai, where Fujifilm is showing off pre-production and prototype samples of three upcoming lenses - the GF 50mm F3.5 - a compact, lightweight standard lens for medium format - the XF 16mm F2.8, and the XF 16-80mm F4 - both of which designed for the company's range of APS-C format X-series cameras. Click through for an exclusive first look at all three, including detailed specifications. @dpreview: please publish the weight for the 16-80 as you did for the others. Thanks! I wish that the 50mm f3.5 was out now, I really want that for travels. Same goes for the 16mm f2.8, its a tiny lens, and a great idea. This kind of makes me want to sell all my stuff and get the 16/23/35/50 fujicrons...they look so good together. It's not "equivalent to a 24mm F4.2 lens in full-frame", it's equivalent to a 24mm f2.8 on full frame. Depth of field at f2.8 will be equivalent to a 24mm at f4.2 on full frame. Didn’t you get the memo? In DPReview World everything lens related is subordinate to depth-of-field/bokeh. hmm, i can see new life for that dusty p6 lenses etc on the shelves. they probably make adapters already.. I am happy that DPR now regularly states not only the equivalent focal length for a native cropped sensor lens but also the equivalent aperture. For example, an APS-C 35mm f/2 lens has an equivalent focal length of 50mm (35X1.5) and an equivalent aperture of f/3 (2X1.5). The greater the crop-factor, the greater the depth of field. If you want shallower depth of field, get a full-frame camera/lens or choose an as large aperture lens as possible. why does a equivalent aperture matter to you? to compare your lens with Kevins, only to maintain who has the shallowest depth of field? an aperture is what it is: a (kind of imperfect) metric for light transmission! They’ve been doing this for years to keep gearheads happy. The fact is, in the realm of optics, aperture signifies the brightness of a lens: f/2.8 is f/2.8 regardless of focal length. Depth-of-field is affected by several factors, with the only single measurement equating to depth-of-field being “magnification at the image plane”. For decades photographers moved between 35mm, medium format, and large format, without this “equivalence” nonsense. Equivalent aperture is very important because it tells you what you can expect to get in terms of subject/background separation. I typically use an Olympus EM10 III with a 25mm f/1.2 lens. The equivalent focal length is 50mm and the equivalent aperture is 2.4. It is therefore NOT surprising that I can get better subject/background separation using a Sony a7R3 with a 55mm f/1.8 lens. f/1.8 aperture is larger than f/2.4 aperture. An aperture is what it is, but its effect with different sensor sizes is vastly different. Dear Fuji, please release multiple versions of your primes. I care far more about OIS than I do weather sealing. I shoot video as much as I do stills, and until there are fast, stabilized primes, I don’t plan on considering any of your cameras. If they make it under 500g, I will consider switching to Fuji from Sony A6000 with 18-135. Me too! I need a lens that has more reach than the 18-55 but that retains a small size. It's not going to be smaller than the 16-55. Need to know the focusing distance of 16mm F2.8. The magic of 16mm F1.4 is that I can get very close to the subject, almost macro range. If the 2.8 can focus very close then it's a must buy for me. That's not bad compared to 15 cm on 16mm F1.4. We will have to see how sharp the lens is wide open at close distances. The 23 mm F2 has gotten a bit of a bad rep for that. I’m on the fence between the 16 mm 1.4, which is on sale right now, or this new baby 16 mm. 16-80 is exactly what I need, for video. I shoot multicam with 18-55 and 50-140. I need extra reach for the standard zoom (overlapping with 50-140, I know) to handle certain multicam-specific situations. Sony, please, we need lens ... Sony APSC users need lens !!! A good standard zoom, pleeease ... Sony 18-105 f4 is huge, electric and a 28mm equivalent in dude angle is not ideal, the quality control is not very good and there is also the softness of the corner ... 16- 70 f4 is harmful, a decent copy of every 10 can come out, totally decentered and also expensive. The slogans of Sony should think that this need is covered in their system, but for the users it is not like that. We need a decent standard Zoom like the one Fujifilm just announced! Wrong thread. This is FUJIIIIIII! Sony doesn't want you to buy APS-C - it's just a feeder system for their full-frame lineup. Will the XF 16-80mm F4 be stbilized? It is marked OIS right on the lens in photo #10. So, yes it is. It looks like the 16-80 features a marked aperture ring, nice :-) It's one silly omission of the 10-24 IMO, glad they fixed it with this new lens. I'm very much looking forward to trying this new standard zoom. Great focal range, somewhat compact and constant aperture. 16-80mm will surely be more expensive, so it won´t be suited as a kit lens (unlike the 18-55mm). I guess because of much larger focal range (plus weather-sealing) it will also be noticeably heavier, my guess is somewhere between 400 and 500g (whereas the 18-55mm is 310g). Anyhow I agree that the future 16-80mm will be a much more useful lens and I will buy it as soon as it hits the market. The 18-55 is the oldest zoom in the line and has reduced AF performance on the later bodies. Both it and the 55-200 are in need of an update due to AF performance limitations (the 60/2.4 also really needs an update) and the 16-80 would make an excellent replacement for the 18-55 in the lineup as the premium kit/prosumer zoom, fitting between the 15-45 and the 16-55 in the line. 16-80 range is hugely popular...see canon 24-105, sigma 24-105, nikon 24-120...canon 15-85, nikon 16-80 etc. travel photos. both canon and Nikon make such a lens for their full format cameras. now Fuji realizes there is a market out there for the traveler and for the guy or gal who has a family. I prefer to take this lens with me on my travel. I do not need anything else. I shot Nikon DX for five years with a 16-85mm 3.5-5.6.VR lens. I enjoyed the very wide + the mid-near tele combination, although it is much larger than the nikon 18-55 kit. I would imagine a similar relative size increase for the Fuji model. BTW, I finally got an adapter ring for Nikon Lenses on a Fuji X-3E3. So, I got to try the 16-85mm on it. Is it a very versatile range to have. Would be even sweeter if it were faster than my lens, like the new Nikon 16-80mm 2.8-4mm. Why all the negative comments regarding MF from the FF snobs? Because they are put in the same position here as the MFT folks are when reading a FF article. Because they know MF is superior yet they can't afford it so there's nothing else to do but be sour over it. For thru hiking, the Fuji 16-80 f4 will make a fantastic combo with the Rokinon 12 f2. I can't wait to get my hands on it. I just hope that the optical quality is good and that the weight is below 500gr. Thinking the same thing. The Samyang/Rokinon 12 F2 and this would be great! I can't wait for the 16-80/4. I think a 5x zoom with a moderate aperture starting at 24mm FF equivalent is the sweet spot for hiking. Not too heavy, not too many compromises in terms of optical quality and (just) enough telephoto capabilities. So far I do hikes with the 16/1.4, 27/2.8 and 60/2.4 (or 55-200/3.5-4.8 depending on what subjects I expect) as they just didn't have the right zoom lens in their portfolio for me. I really hope that Fuji put their focus on optical quality rather than a low price tag. But looking at most Fuji lenses I guess good optical performance can be expected. Depending on the performance of the 16-80/4 at 27mm and 80mm I might even sell the 27/2.8 and 55-200/3.5-4.8. I don't like to have too many lenses lying around that I rarely use. The 16/1.4 is still great for night/astro photography and the 60/2.4 for macros. I can´t wait for the 16-80mm as well. In my DSLR times my favourite and most used lens was a 16-85mm f3,5-5,6 lens (Pentax). It was the best lens for travelling and shooting out in nature (it was not possible to switch lenses most of the time); the focal range was very useful, 16mm was wide enough for landscapes and 85mm was acceptably long (a notable difference comared to usual 50 or 55mm), and most importantly still retained decent optical quality (something that zooms like 18-135 or 18-200 couldnt deliver). Plus it was weather-sealed (typical for Pentax) which I really appreciated (the lens survived drop to a waterfall). As a typical outdoor lens I didnt mind the slow aperture. So now with Fuji I miss such an universal lens a lot. I use the kit lens 16-50mm for travelling and while it´s good enough for a kit lens, it´s still only a XC all-plastic lens, so a decently build XF lens with WR and much longer end (constant f4 is a bonus) is something I really crave for. Nice lens, but a really slow F6 FF equivalent. And it’s at all focal lengths. Due to this, I can see why Fuji is keeping the 18-55mm in the range. As I said, I had a 16-85mm with f3,5-5,6 and I really didn´t mind that it was f5,3-8,4 equivalent, since oustide I stopped the lens down most of the time. An f4 or f5,6 zom lens is not a portrait lens anyway, you put my f1,2 prime for that purpose. As regards the 18-55mm, in my opinion that lens will be obsolete after the 16-80mm comes. True, it has 2,8 at the wide end, which might be more handy indoors, but as you zoom in it slows down to the same f4 like the 16-80mm; it is both shorter and narrower and not weather-sealed. The only advantage of 18-55mm will be the price (since the 16-80mm will most probably be a lot more expensive). 10-24 and 16-80 with xt20/30. What a combination for long hikes. I hate full frame on those hikes because I need to get heavy glass for high megapixel bodies. How about update the current f1.4 lines to a better AF motor and speed and with WR? f2 lines with WR and seems have faster af drive me crazy. The Canon 40mm is not a very good lens though. I owned the Canon 40f2.8STM on my 6D and the result was really nice even wide open. After a few month I changed it for the 35f2IS , most for the FOV that I prefered. When I was comparing the images made with both lenses the 40mm was not in shamed at all, even the 35mm was effectively better. The Canon 40mm pancake is a very good lens. Maybe not as sharp as the EF35F2IS, but it is definitely sharp enough. And it doesn't produce such "stretchy" nervous corner bokeh like the 35mm does. Plus, it is much smaller and much cheaper. And you can actually adapt it to GFX cameras. The EF 40mm STM is stellar. No doubt the GF 50mm F3.5 will be as well. 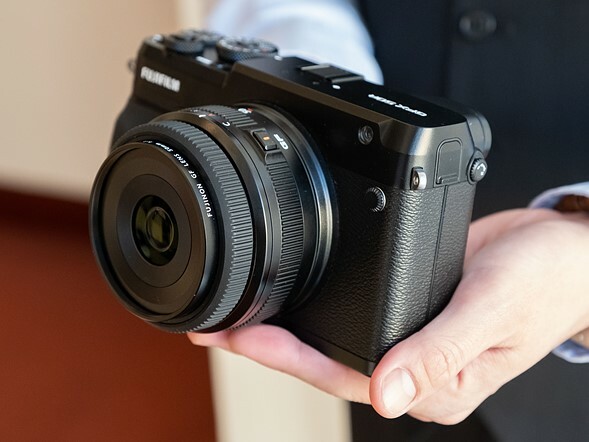 Well the EF-S 24mm STM is also very good as the EF-M 22mm STM or the XF 27mm F2.8..
Fujifilm is very smart to offers great compact/all-around solution (X-system) and premium GFX..
Fujifilm lenses are 10X better than Canon glass. Interresting... Which Canon and Fujifilm lenses did you owned, use and compare to come to a so precise affirmation? "The Canon 40mm is not a very good lens though." Why speak about something you obviously know nothing about? Why? "Fujifilm lenses are 10X better than Canon glass." Do you even read what you write? If I knew now what I knew when I started with my a6000 5 years ago, I probably would have gone for the at-the-time-new X-T1. Yes, more money (and it was still some time until the f/2 family came out!) but I would have spent less over all than what I have now. It's all about the lenses. Both the XF27 and GF50 are around 40mm in full frame and both are the pancakes of their respective systems. Wonder if there is something about that focal length which allows for compact lens designs. That focal lenght is roughly the same as the frame's diagonal: 27 mm por APSC, 40mm for 35mm, 50mm for this MF sensor. I want the 16MM to be @ F2 not 2.8 But guess will be a good lens. Also Missing now a 10MM or a 12 MM f2. Just buy a Samyung or Rokinon 12mm f2. AF really isn't necessary with lenses that wide. I agree with DGP - I dearly liked my Rokinon 12 mm f/2 for my Sony E-mount. Excellent lens and amazing for astro. The Laowa 9mm is supposed to be very good as well. "Rokinon 12mm f2. AF really isn't necessary with lenses that wide." how do u use it? or u MF every shot? Its really simople to MF a 12mm lens at f2. Just break the focusing range into three parts, close, medium, and infinity, and just approximate based on the distance of your subject. Easy peasy and the subject will be in focus. Hyperfocal distance at 12mm f/2 is just shy of 12 feet. Find the hyperfocus, mark it, and you're all set for anything farther away than a basketball free throw line. Obviously you'll have MF for anything closer, but at 12mm it's pretty easy to approximate it as DGP mentioned. f2 would require a larger lens, making the 16 f2.8 allows the size to remain small, and if you need more speed there's already an f1.4 option. That 16-80 looks good. Very compact too. This is the most interesting lens of the set to me. Great looking camera and lenses. Why are Fuji's f/2 WR lenses so long? Why couldnt they be pancakes? Just look at the Canon 22/2 or Samsungs old 30/2 and 16/2.4. because them hipsters demand that aperture ring, jk. my guess is the better build and weather resistant materials. I still love my 22/2, fits in my jacket pocket. But how could Fuji charge more if those lenses were smaller? To make them sharp, well-corrected and functional, maybe? Look at the Sony 16mm f/2.8 - tiny, and also a POS; the Canon 22mm f/2 - vignettes like crazy, has field curvature; the Panasonic 20mm f/1.7, optically good but slooow AF; the Canon EF-S 24mm f/2.8 - good, but a stop slower; the Sony 35mm f/2.8 - good, but a stop slower; and so on. Kharan, Fuji lenses have many of those issues as well but Fuji bodies correct issues even in RAW. Canon bodies might not do that, but one needs to settle for 3-year-old tech. Nikon bodies might not do that, but one needs to pay the premium and get stuck with temperamental tech. MFT bodies might not do that, but one needs to live with the small and old sensors. I would rather a compact lens not have to compromise on its compact size. Its strange because Fuji already has bigger brighter versions of their "small" 16/23/35/50 lenses that dont compromise on IQ. If you want better IQ, then just go with one of those. Also Im not sure that the actual reason they are longer is because they are better optically, the 23/2 for example ironically takes soft photos when shooting anything close. Fuji tried the pancake idea with the 27/2.8, while a great lens, it really hasn't been too popular. The f2's however have been much more successful, and are a good combination of size and speed. And keeping the aperture ring allows the Fuji bodies to be both small and reasonably glove-friendly (gloves and aperture rings/shutter speed dials work well, mirrorless-sized buttons not so much with gloves). ^ Probably because the 27/2.8 is too slow. A 23/2 pancake would be much more popular. Not sure what an aperture ring has to do with making the lens so much longer. Its just a fly by wire ring. All the pancakes mentioned already have fly by wire rings (for MF). "^ Probably because the 27/2.8 is too slow." - Probably because it's overpriced. They are corrected better and sharper. To make the pancake, they did it with the 27 2.8, but it's nice wide open... to do the 23 f2 smaller, they had to insert it into the body of the x 100. The 27 2.8 is my most used lens even though my others out perform it. Very handy, go everywhere lens. 2 rings (aperture + focus) takes more space than 1 ring (focus). Especially if the ring is large enough to be usable. A good chunk of the Fujicron's size is about having really usable focus & aperture rings. Additionally, making a well corrected f2 lens simply takes more elements & groups than an f2.8. The 27/2.8 is a 7/5 design, the 23/2 is 10/6. Note the 23/2 is almost exactly double the length of the 27/2.8, with double the control rings. I guess Fuji lens engineers should learn a trick or two from Canon and Samsung. They had it right with the old Fuji 18/2, but either they gave up or just didnt want to damage x100 sales so they intentionally made it longer. The 18mm f/2 is pretty disappointing wide open, and is hardly a good example of compact lens design. If they go that small, they either have to sacrifice maximum aperture or correction. They should have gone FF instead. Unfortunately, they keep trying to make a point by "breaking the laws of physics" and proving that APS-C system is just as good, while "smaller", which is false and simply not possible. So, they fail every time (obviously and predictably) and all we get is not as good as FF (or Bayer for that matter), same size, plus unreasonably expensive optics. I'm sure that it's good enough for many people, but "good enough" doesn't cut it, when there's better for the same price or even cheaper. I think that I would prefer the XF23F2($449) over the F2.8 pancake for the same price (same goes for 16mm), but then I can (and I do) have an F1.8 equivalent FF pancake (the EF40F2.8STM) and it's 3 TIMES cheaper. How does it make any logical sense to anyone? Why not just save your money, get a GFX body and adapt some cheaper FF lenses to it. Sounds like a much better deal to me. No need to sacrifice performance. Just make it the pancake size of the Canon 22/2. The Fuji 23/3 is longer and already suffers from softness when shooting close. Its currently a lose/lose with no benefits. If you're so set on bigger size, get the 23/1.4. No point of the 23/2 when its thinner but just as long and with poorer IQ and aperture. But the Fuji doesn't vignette nearly as much, is much better built, focuses faster, has an aperture ring and a properly-damped focus ring, and is just as good, if not better, shooting at longer distances. I don't tend to use a 35mm-equivalent lens for macro, anyway. I think that as soon as I'm finished with a project in which I'm going to make a good profit, I will be selling all my Sony apsc and FF gear to buy Fuji. These cameras and lenses are what real photo equipment should be. The best mirrorless system in Aps/c and MF. Well done fujifilm. You prove that you're a real photography company! That 50 on the '50 makes it look almost like an oversized Rollei 35. Want. @DPR Staff, any Samples from the XF 16-80 F4 WR soon to come? ;) I am curious - about a 1:1 Image Comparsion with the XF 18-55/F2.8-4 Zoom. Forget megapixels and dynamic range. Manufacturers are now competing to provide the best trips. Education isn’t a criteria, none of the editors have degrees in imaging or optics. But I’ve been on my fair share of lavish press trips in a different field and they’re no fun; you’re cooped up with a bunch of hyper competitive other writers, supercilious, smug PR people, and anxious, anxious manufacturer staff. And they feed you gross, over-thought restaurant food. Why does Fuji hold the event in a totally artificial place, totally alienated from human history including the history of the Arabian peninsula? That berg is the future of the Arabian peninsula—someday people will marvel at it the same way we here in the present gape in wonder at Sumer. A used X-T20 or even X-T10 sounds like a better option instead of the X-A5. Above all they have an EVF. Also better build quality, more controls - all these give you the "full" Fuji experience. The XA's are great little cameras when paired with a wide-ish lens. I've generally loved the XA-1/18 combo as a pocket camera and the 27 and 23/2 both also work well. I expect the 16/2.8 to be a good fit for that sort of P&S with a real lens shooting. They're best paired with an EVF-equipped body for when you want to do more serious shooting though. why no mention of XF 16-80mm F4 weight? At this size, hopefully similar to the 10-24, but no idea. Fuji makes XF and they make GF. I doubt they will start a new third extensive lens line. But a Contax G equivalent small FF body with a (21), 28 2.8, 35 2.0 , 45 2.0 , 90.2.8 would be interesting and may be a small enough lens line to start a project. Just let the balloon fly and see what will happen. Those who are questioning the utility of an f4 lens probably don't shoot many landscapes. I can't even remember the last time I shot a landscape at wider than f4. If the IQ is up to scratch, this and a small body could be a brilliant hiking combination. > I can't even remember the last time I shot a landscape at wider than f4. I agree. I'm mostly a landscapes/hiking shooter, too, and I rarely shoot even F/4. I use aperture priority mode and default to F/5.6, where lenses have the best resolution across most of the frame. When I really want subject isolation I switch to an F/1.8 prime. This is where having less depth of field helps APSC too. I miss my fuji gear. Existing 18-135mm is also good at f8-11. The new 16-80 f/4 lens is an intriguing option, one I would definitely consider as an all-arounder. It's confusing, though, how much it will overlap with the existing 16-55 f/2.8. Will be fascinating to see how IQ compares. Just like many other brands in FF have a 24-70 f/2.8 and a 24-105 f/4. The 16-55 f/2.8 is really a beast for a crop (doesn't even have optical stab!) this alternative could be a good one while traveling. Just about every other maker has that split as well. Wide-range F4, narrow-range f2.8. As long as the f4's optically good it gives the landscape guys a lighter, wider ranged options while the more speed sensitive folks get their fast aperture zoom. The current 18-55 and 16-55 overlap much more. I expect the 18-55 to get aged out of the line because of that and its AF performance limitations on the newer bodies. If I invite DPR staff for my Munich press event of the release of my 50mm F/50 pinhole lens, will you all come? if you pay their plane tickets and hotels, i am quite sure they will come. Only if you give it a hideously complicated name like the '50mm F50 Falconlux ET L WX'. They might come,..... but they will not publish abword about it. So your investments will be spent for nothing. Just make shure it is during the Oktoberfest time and free F&B ist provided. This new Fujifilm 50mm f3.5 is equivalent to Canon's 40mm f2.8 STM? In terms of specification, yes. But only in the same way that a Nikon 50mm F1.4D ($370) and a Zeiss Otus 50mm F1.4 ($3999) are equivalent. I'm not saying the difference here will be as big, but equivalence only tells you the most basic parameters, not the performance. Richard makes an important statement here. This is why information like “nine elements in six groups, including one aspherical element” is as important as the equivalence footprint. And add to it that given an equally advanced optical formula, the larger format version will still excel. Because it is harder to correct for aberrations with a smaller format (for an equivalent offering). This can be proven in a mathematical way. Incidentally, Canon's 40mm f2.8 works pretty well on the GFX covering the 44x33 sensor easily. In fact even Canon's old 35mm f2.0 covers, which was the biggest surprise out of all my legacy lenses. Maybe it's just me, but I still like my front elements bigger than the rears. bigger front elements mean larger area that can more easily be scratched. The reason for big rear lens is that you want the lens to be telecentric for digital cameras. So - if the lens not is in particular fast, then you can put the optical waist near to the front lens. And, then they will look like this lens. It is kind of optimal in this case. And - at the same time you get an object space telecentric lens! That is cool. Then you will get a very strange perspective. I.e. no perspective. Far away objects will not be smaller. And thinking about it, I think that a true telecentric lens must be bi-telecentric. I cannot see how two non-parallel light cones can come put the other end being parallel. Fijifilm continues to hit home run after home run. I'm so happy to be shooting Fujifilm's X system! I am really waiting for this 16-80 F4 Zoom, because back into the X-Pro1/E1 Introduction, there was only the 18-55/2.8-4 "Kitlens" being avialable - and still is..the F2.8 16-55 is a huge behemoth. Of course, the cheaper XC 16-50 and 15-45, which are optically great (for their price! ), but the 16-80 should have been avialable - already from the start, back into 2012. I hope it'll being good, optically. For instance, it should being comparable into IQ with the Nikon Nikkor 24-120 F4 Zoom Lens, which is FX, FF, but also bigger. Maybe it'll cost something between 799 to 999 bucks, i'd think...the XF 16-80/F4. As for the 16-55, some Reviews say, IQ is less than the 18-55. I tested the Z7 with the 24-70 S. It is a tight package a light well built camera. I can see it taking the place of apsc cameras very easy. I am sure the Canon and Sony systems are the same. Foto64: You should consider the whole system. There is certainly a considerable overlap between APSC and FF when you compare equivalent lenses. With ff systems there are faster and bigger, heavier lenses available, with apsc systems lighter, smaller but not so fast lenses. But you are right in so far that there are f4 standard zooms available which are smaller and lighter than the Fuji f2.8 16-55mm. Would be great if Fuji would bring a replacement here. But I wouldn't decide for a system just because of one camera-lens combination. APSC lenses are not much smaller and lighter that FF . To get any real advantage there you need to go with MFT. Now that there are FF mirrorless cameras out in force APSC has lost any real size advantage. @Foto64: Fuji f2 18mm, f2 23mm, f2.8 27mm, f2 35mm, f2 90mm. Where are similar sized lenses on FF? Maybe some Rokinon for some focal lengths. Are a few ounces going to kill you. Go to the gym dude. rationalist: Pretty close on E-mount: Samyang 24mm/2.8, Sony 35mm/2.8, Samyang 35mm/2.8, Sony 50mm/1.8, Zeiss 135mm/2.8. kolyy: Absolutely yes for the Samyangs. I thought it was Rokinon but maybe they are all the same. I hope that Sony themselves will start to release such very small, not so fast high quality lenses. Not everyone is interested in the lowest f-stops possible. I don't feel that I need those and prefer lenses attached to cameras over camera bodies attached to lenses. Instead of always being lovingly cradled in a pair of clean, well-manicured, hands, I'd like to see all new equipment gripped in the slobbering jaws of a large friendly mad dog. My APS-C MILC system to date is still a Samsung NX30. The Samsung NX lens range features a 16mm F2.4 lens, but not a 24-120mm FF equivalent lens. I know that sooner or later I will be "obliged" to switch to another brand if I want an APS-C system with the latest technologies. I also own an M4/3 body with the Panasonic 12-60mm F3.5-5.6 (with the same equivalent focal range than the Fuji 16-80mm that covers most of my needs) that I find pretty good wide open for a "kit" lens. Are you frequently in a situation where you need a broader field of view without the possibilty to step-back ? Do you often think that, when you can step back, the perspective has changed in a way that does not satisfy you ? Do you often need a greater depth of field ? As Karroly has already said, you are the one to judge. I would probably say no. Also, IMHO, UWA are "hard" to use. Because far away objects become very small, you must take a very great care to the composition. Unless you want to make a landscape panorama from a single shot or shoot starry sky, UWA are "limited" to subjects with interesting elements in the very foreground, IMHO. That is weird, I answered to much more longer post from you where you talked about UWA as a better option than a 16mm. You edited it, right ? Thanks Karroly, as you said I don’t know what 16mm will bring. I will definitely try the new 16mm f2.8, I might enjoy it.